I’m due to go to a wedding in future, and I fear my mucked up sense of fashion is due to create another disaster. Weeeee disaster. I’m good at those. Some truly hideous attempts in my early teens bade me retreat to jeans and hoodies for ten years, so I missed out on some prime time to experiment. Now, this wedding I am going to, I am experimenting a little. 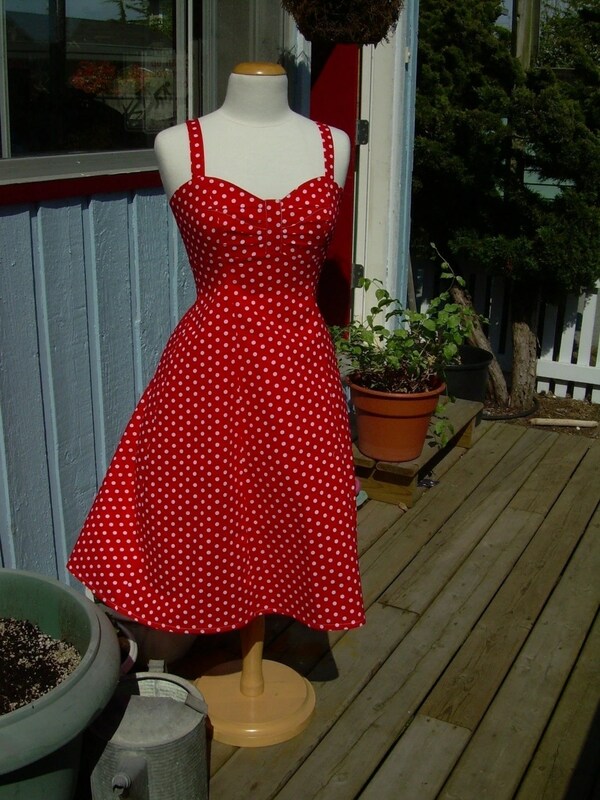 The foundation of the outfit is this: a Jane Bonbon braless dress in red polka dot. It’s custom fitted to my measurements, or at least my measurements of the time I ordered it. A classic summer look that will not, hopefully, class too much with the deep red of the Bridesmaid dresses. I mean aside from the fact it is blatantly a different dress. Note to self – find out colour schemes THEN ORDER THE DRESS next time. I’m going to pair it with a white or brown shrug from this selection at yours clothing. A very cheap online retailer in the UK which has a variety of shrugs. Any suggestions about which of those shrugs to go for are completely welcome, although I don’t like ones that tie or fasten across the chest. Accessories wise, I’ve plumped for something that is probably a bit over fashion for this dress, a steampunk style necklace from etsy. 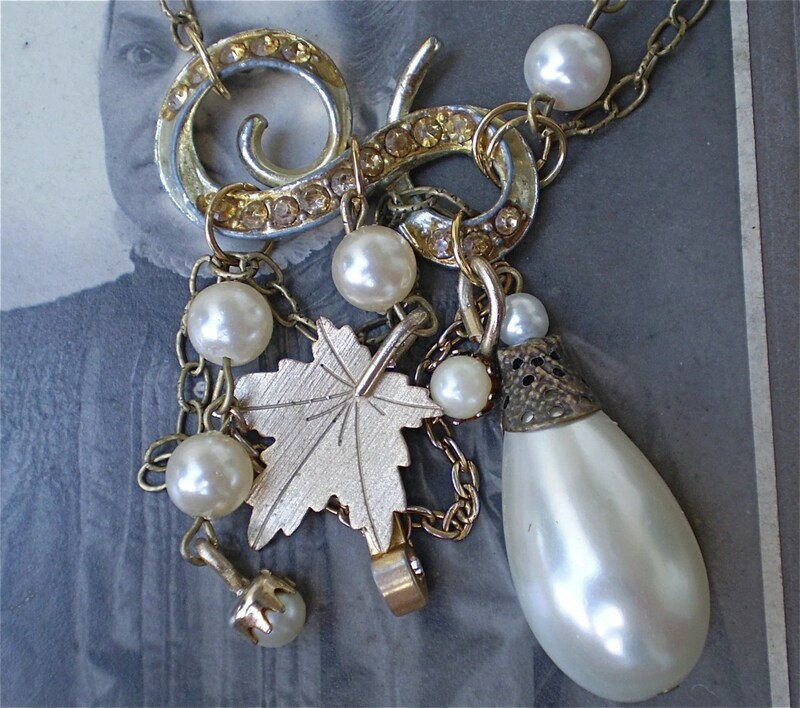 It’s very pretty and I love it, and I haven’t purchased a gorgous necklace in years. The seller, arieltelsa, also sold some adorable earrings that may be too much with the necklace, or that I might wear on their own. They’re called starlett earrings, and feature gold and silver pearls and some funky rhinestone buttons. However, to be fair, the dress and the shrug aren’t exactly steampunk by any stretch of the imagination. I would have been better off going with a straight string of pearls. Also, matching a pair of witchy, brown, victoriana lace up boots with this dress would be bloody awful, so I’m a little stumped for shoes at the moment. My old idea of some patent white or tan peep toe wedge sling backs seems to be failing fast. I kind of adore these by Marco Tozzi, but my sense of whether it would work with the jewelry, dress and shrug combo is sincerely lacking. I also fear that I would not be able to hold up well wearing 7.5cm heels all day, no matter how comfortable the blurb says they are. The Caprice Shoes in nut would probably be perfect style wise, except I look a little odd in ankle shoes with a dress, it makes my legs look out of proportion with the rest of me (i.e. short calves.) Regardless I want, because they are stunning, beautiful pair of shoes with a fabulous heel and detailing. Unfortunately for me they happen to be 40 pounds more expensive than the Marco Tozzi. Gah. I’m kinda liking these Emily Strange Kitten Heels, although I’m not certain that a 2.5 inch stilleto is walkable for me. I’ve found a decent back up at clarks, locally, which is a double strap court with black patent heel, sole and strap detail, and suede everything else. It’s a tiny bit tight, but…yeah. My only worry is that they are too black, where the Emily Strange heels have red and white on them. I decided to go with the black lace look shrug to compliment the darker shoes. This also means I don’t have to buy a new clutch bag, although mine is extremely basic. Although the black lace shrug has now apparently sold out in my size. Whoopee. That leaves these two as my alternatives, which aren’t a million miles away from each other. I’m leaning on the side of the knitted one, purely because it is more similar to the original lace style one I had picked out earlier. Just so you know, I’m a totally wanting to buy both the standby shoes, because they’re comfy-ish, if a little tight, and I can walk well in them. There is none of the wobble I get from stilletoes, so I can stride out with vigour instead of mincing about. However the Emily Strange shoes are my kinda…fun. Pretty conservative heel height and shape, but I like the colour and the little pattern. It’s something I could slip on with a skirt or a pair of work trousers and feel totally comfortable wearing to work. Also, the red strap would stop them falling off, which is a majour problem I have with most heeled sandals, court shoes and mules. Now all I have to think about is my bloody hair. Victory rolls, maybe? ~ by Pewter on August 5, 2008.